This comprehensive directory serves as a richly illustrated, in-depth analysis and overview of the most important conflicts in which China is currently, with a particular focus on People's Liberation Army air power. From the South China Sea to the mountains of Nepal, the continued economic rise of the People's Republic of China has led to a dramatic shift in the balance of power in the region. As a result, the relationship between China and its neighbours, as well as with the United States and its allies, has become increasingly important for the future of the region - and for the rest of the world. This uniquely compact yet comprehensive directory serves as a richly illustrated, in-depth analysis and overview of the most important conflicts in which China is currently involved - and those that it is likely to be involved with in the future - with a particular focus on People's Liberation Army air power. Few expected the advances in China's economy and military to be made so quickly. With the surprise collapse of the Soviet Union, a former common enemy was removed from the equation, focusing attention on differing systems of governance, competition in the realms of economics and security, and growing interdependence. While the strategic situation in the region and the interdependent relationships are dynamic and complicated, these themes are explained in clear terms by Andreas Rupprecht, a leading observer of Chinese aerospace and the country's military-industrial complex, and Tom Cooper, the co-authors of the highly regarded Modern Chinese Warplanes from the same publisher. 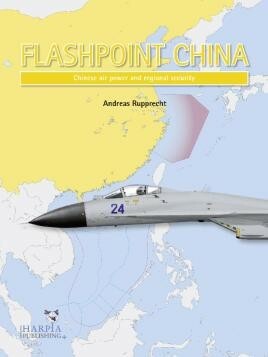 Flashpoint China is one of the first books in an all-new format from Harpia Publishing. Those readers familiar with Harpia's previous titles will recognise the layout, colour codes and high-quality paper. Compared to earlier Harpia titles, however, the new series are altogether more compact, running to a total of 80 pages, and enabling coverage of ‘smaller' themes. Of course, these books also retain the now-familiar in-depth coverage, painstaking research and lavish illustrations (around 75 in all) of their ‘bigger brothers'. ...well-written and produced...covering important subjects and would make recommended additions to any bookshelf. There are plenty of clear colour photographs depicting Chinese aircraft to aid build projects. A very good and digestible read to gain insight and understanding of the complex political and military situation regarding the Chinese sphere of influence and interest. An extremely informative tome which would be of value to current serving Air Force and Naval Aviators of the countries covered, as well as for Defense and Security analyst, service colleges and academy professors, Staff Officers for Intelligence, Operations, Logistics, Plans and Special Studies.